You know you want to sing along: it’s the most wonderful time, for a beer!! I’m here to hold your hand through this process, because, if you are a fan of Founders, especially KBS, you know how challenging it can be to acquire such a precious beer. I talked about it on my eightWest segment earlier this week. Check it out! Founders Kentucky Breakfast Stout is an Imperial stout brewed with coffee and chocolates, then cave-aged (yes! under the city!) in oak-bourbon barrels for a year to bring out the mouth-watering bourbon in the finish. Founders KBS is consistently ranked in the top 10 all-time best beers in the world by Beer Advocate, Rate Beer… and by beer enthusiasts everywhere. The demand for KBS seems to grow every year, so much so that it’s nearly impossible for Founders to keep up with demand. 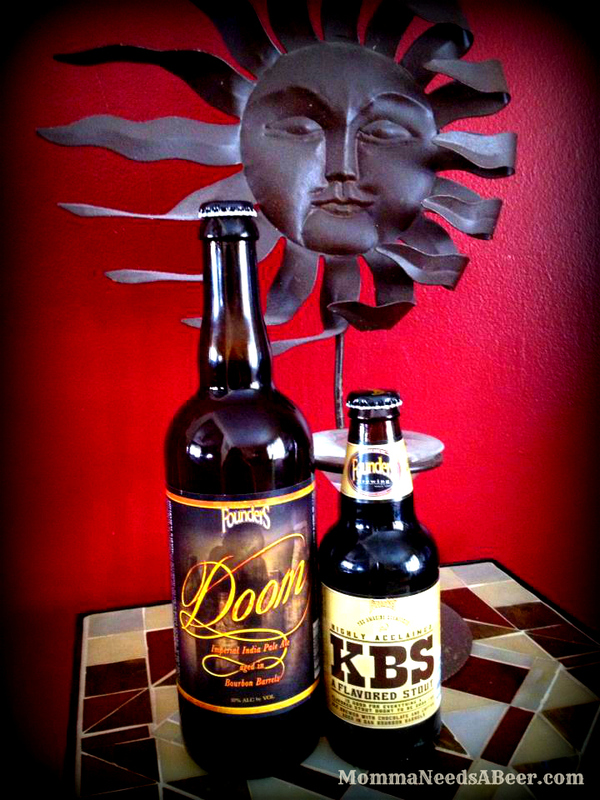 KBS sells out very quickly whenever I personally see it on tap or in stores. Pro-tip: See a variety of Founders’ beer on your grocery store shelves and it’s the beginning of April, but you don’t see KBS? Ask a manager (quietly) if they have KBS in the back. I lucked out last year; I was grocery shopping already, planned to make a KBS stop when the liquor store opened & simply asked the manager if they had any KBS in the back. He did. He was only giving it away to people who specifically asked because each distributer receives a very limited amount of 4-packs. On Saturday, March 30, you can join in on the KBS celebration at Founders for the KBS Release Party, the first day KBS will be available on tap. All-day, Indoor-outdoor FREE event from 11am-2am. A heated tent will be raised in the front parking lot to accomodate more people, with additional seating & an outdoor bar. Maybe you’re sick of hearing about KBS and just want to hear about a NEW beer already!! You are in luck, because the next beer in Founders Backstage Series is DOOM. What is Doom, you ask? Founders Doom is essentially Founders Imperial Double IPA, Double Trouble, aged in bourbon barrels for four months to create a unique experience for beer lovers. Founders was gracious enough to give me a bottle to try on the air earlier this week. Good heavens… Founders Doom is a new favorite for me. They had me at Double IPA… and to toss in the bourbon-barrel aging? Hello, lovah!! And guess what? There are STILL tickets available to reserve a bottle of Doom!! No lines to fight, no bottles to break over anyone’s head to get your grubby little hands on your own 750ml bottle of Doom. Yes, really!! Reserved bottles will be available to pick up in the taproom for ticket-holders starting April 14th. Founders Doom will be available in the taproom and in limited quantities at select bars & stores starting April 22nd. Keep in mind that Founders Backstage Series of beer are brewed in limited quantities and may not be brewed again. Consider yourself warned. What is your favorite spring beer release? Let me know in the comments! This entry was posted in Uncategorized and tagged doom, founders, kbs, MIBeer, spring beer, thirsty thursday. Bookmark the permalink. Post a comment or leave a trackback: Trackback URL.